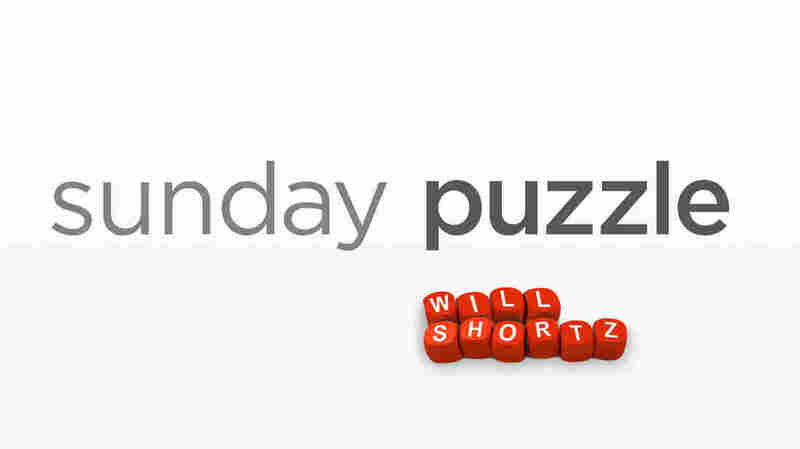 Sunday Puzzle: The Missing Link NPR's Lulu Garcia-Navarro and puzzle master Will Shortz play the puzzle this week with Matt Pallai of Denver, Colo.
On-air challenge: I'm going to give you two words. Think of a word that can follow the first one and precede the second one, in each case to complete a familiar two-word phrase. The last letter of my first word will start your answer, and the last letter of your answer will start the second word. Last week's challenge: This week's challenge comes from listener Mark Oshin of Portland, Oregon. Think of a familiar two-word phrase in 8 letters — with 4 letters in each word. The first word starts with M. Move the first letter of the second word to the end and you'll get a regular 8-letter word, which, amazingly, other than the M, doesn't share any sounds with the original two-word phrase. What phrase is it? Winner: Matt Pallai from Denver, Colo.
Next week's challenge: This is Part 1 of a two-week challenge. You'll need to solve both parts before you send in your answer. So hold your answer for now. These four words have a very interesting and unusual property in common. What is it? You will need the second part of the two-week challenge before you can submit an answer to this puzzle. Tune in next Sunday or head to the Sunday Puzzle page on npr.org, Aug. 12, to hear the second clue for this challenge.